Are you thinking about buying a blender for the first time? Can’t decide why you should get yourself a kitchen blender? Looking for the advantages of a blender over any other tools? Then look no further. Because this article will answer all your inquiries. A blender is a machine with rotating metal blade at the bottom. It is powered by an AC motor. There is a set of buttons for different functions. When you switch on the blender the blade will start rotating. You can put any fruit or vegetables to mix, emulsify or even juice them. You can even crush ice with it. Doesn’t it sound like a useful machine? 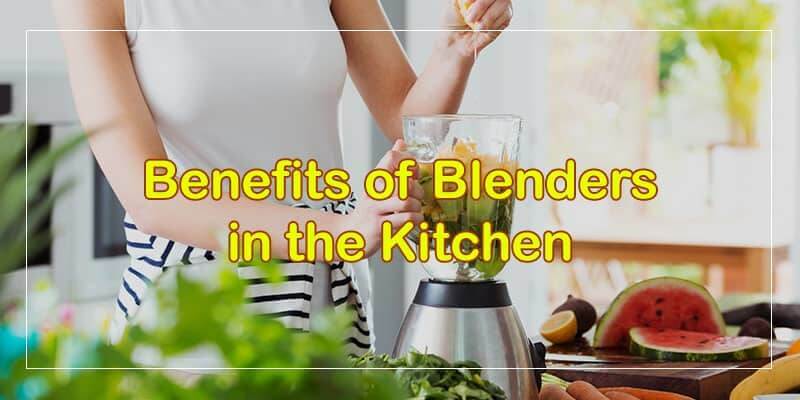 Blenders play an important role in our daily life as our kitchen can’t really be fulfilling without a blender. The first and most common use of a blender is to make fruit juice. All you need to do is just slice the fruits you like and put them in the blender. Give them a good blend and your healthy fruit juice is ready. It is important to consume fruits on a daily basis. But most of us can’t make it every day. And there are the children who can find a hundred excuses not to eat the fruits. For all of those out there, a blender can be an easy way to make up for the daily nutrition they need. Just put all kind of fruit you want and make a fruit cocktail. In our busy lives, it is not always possible to have a full plate of traditional salad every day. But don’t worry. Blenders have got your back. You can cut all your favorite vegetables and blend them all together. This way you can have all the nutrition of the vegetables in one go. This will also save a lot of time. Nagging with children about eating vegetables is every parents’ daily routine. As kids can sometimes be really picky about the vegetables. Blending the vegetables can be a solution to this problem. This way parents can balance the nutrition gap of their kids. We all know about the goodness of smoothies. And using a blender is the most convenient way of making smoothies at home. Just add the ingredients and give them a good blend for a couple of minutes. Now just sit back and enjoy your healthy and delicious smoothies at home. Making milkshake at home is impossible with a blender. So just put the milk, cream, ice and other ingredients into the blender to make your favorite milkshake. Using a blender for juicing instead of juicer has some extra benefits. Juicer will extract the juice from fruits leaving all the pulps. This way you are simply wasting all the fiber and calcium present in the fruits. On the other hand, if you use a blender in place of a juicer, you can have the whole fruit without wasting any fiber of it. This will keep the all nutrition of the food well balanced. You can almost blend every kind of fruits and vegetables in a blender which is not possible with any other tool. Blending is, literally, the most time-saving kitchen tool out there. All you have to do is press the button. This can help you make juice, salad, smoothies in much less time than any manual procedure. Blending helps to balance the sugar level in our blood. As it doesn’t waste the fiber of the ingredient, so the sugar is also well balanced in drinks made in the blender. This help to properly maintain our sugar level. Another common use of a blender is to crush the spices into powder or paste. You can simply powder your spices and replace the store bought spices with it. You can make them into a fine paste if needed. You can actually make sauces into a blender at home which will taste even better than the store bought one. From tomato sauce, chili sauce to mayonnaise, you can make everything in no time with your kitchen blender. You can make any salad dressing with the help of your blender in real time. You can make a puree of any kind of meat with the help of your blender. Mixing is way easy with a blender. You can mix spices, or any solid with liquid with your blender. Just put them all tougher in the bender and press the button for a couple of minutes. You are done. You can easily crush ice with your blender but make sure your blender jar is made of good material. Now you can use crushed ice on top of your juice or any drink. It’s very easy to disassemble the blender parts, which make the cleaning easier. You can just wash it in the sink with your regular dish soap and tap water. Air dries after you are done with the cleaning. If you invest in a good quality blender, it will last you a very long time. Use it with proper care. This can be a great addition to your kitchen tools. In today’s busy life, a blender is a necessary tool for our kitchen. It not only saves our time but also promotes healthy eating. Blender reduces the loss of nutrition and helps to balance the sugar level as well. So having a good quality blender can really be handy. So invest in a good blender and handle it with proper care. Because with this, you can almost make any juice and get you’re mixing done in no time. Isn’t it a great tool to use every day?